I really, really, really was not expecting this series to end the way that it does. 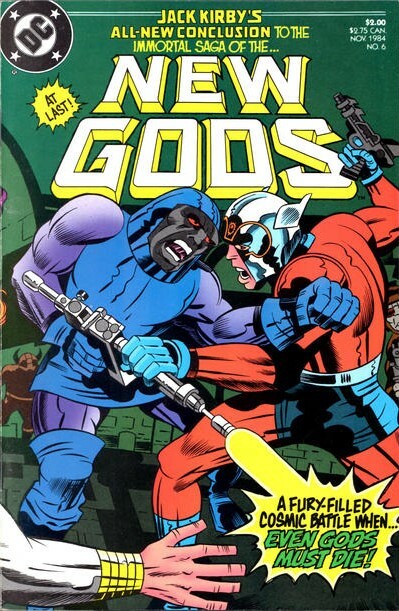 In the earlier issues, there are some editorials by Mark Evanier, and I think it's there that the idea of an alternate history of the New Gods is suggested. One is the primary timeline, the one that continues to this day, and that is made possible by the cancellation of the Fourth World titles before the conclusion of the tale. In this timeline, Steve Gerber gets to write Mister Miracle, and Grant Morrison tells what I feel is the best New Gods story in Final Crisis. The other timeline is the one that is enabled by today's comic, published with an entirely new conclusion to the saga, one that leads into the Hunger Dogs graphic novel. It's this timeline that is collected in the recent Fourth World omnibuses, and it's one that couldn't really be incorporated into the main DCU continuity. Anyway, here we go, SPOILER ALERT!!!! Since the beginning of this series, we've seen Orion barrelling headlong through battles and conversations, always with his eye on the prize of halting Darkseid and restoring peace to the universe. An interesting motivation for an ostensible god of war. But what we get at the end of the issue is the denouement of that headlong rush that was unexpected. We're trained, especially in comics, to expect the hero to win, even if it ends up costing a lot in blood, sweat, and tears. Instead in Kirby's opus, Orion is struck down on the second last page, his quest unfulfilled, and his enemy still alive and well. I'm dying with curiosity to see how The Hunger Dogs continues the tale, though I think I may be right out of luck finding a reprint of it. I was reminded of Final Crisis, in that the tag line for the series was The Day Evil Won, and it really seems like that's what's happened in New Gods. Who will stop Darkseid's conquest of Earth now? What I really need to do is go back and read Mister Miracle now as well. That way I will have read the clash of the New Gods from the perspectives of both of the switched sons. I wonder if his story is wrapped up in the graphic novel as well.